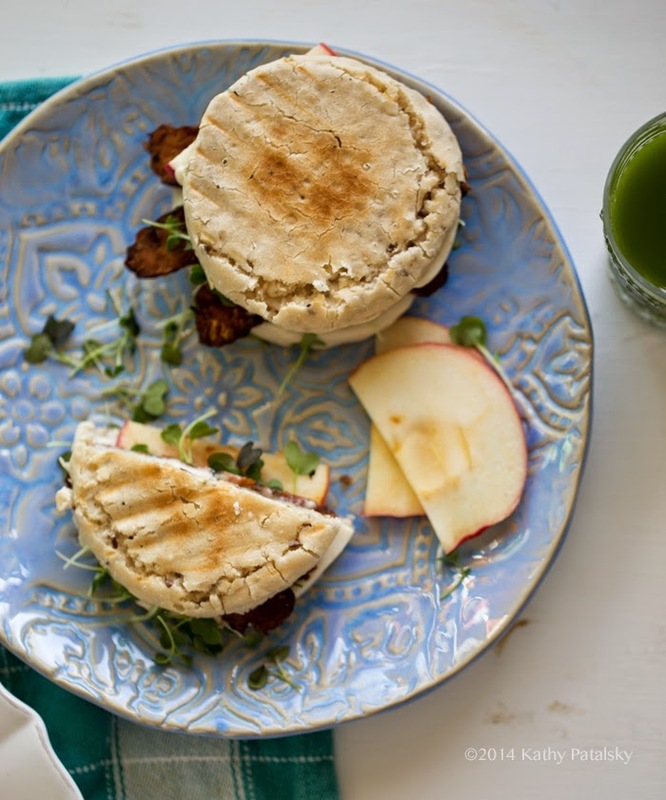 Grab a plate and serve up these Vegan Apple-Bacon-Maple English Muffin Grilled Cheese Sandwiches. 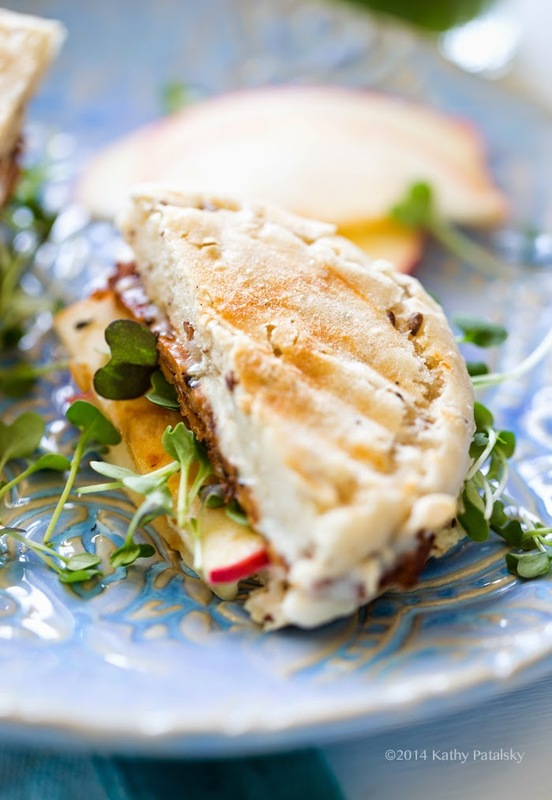 The silky-savory vegan provolone cheese melts over top crispy-sweet apple and smoky, savory tempeh bacon. 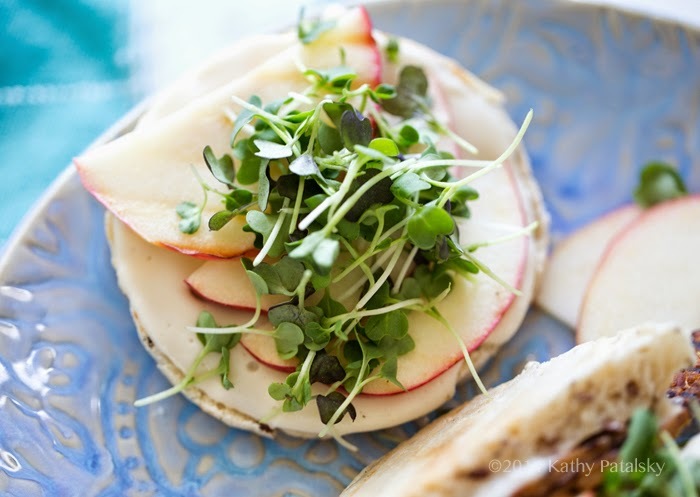 Green sprouts or micro greens add some lovely freshness. A hint of maple too! All toasty warm on a gluten free English muffin. Oh happy day. Get the easy-peasy recipe + a food for thought chat on strengthening yourself from the inside out!.. Today's food for thought: wellness strength training. And I do not mean just your muscles. We are whole complex beings. We have our wellness strengths. And we all have weaknesses as well. What are your "wellness weaknesses?" Survey your whole self, mind body and spirit, and you can probably spot them. Are you as strong as you'd like to be when it comes to: your emotions and expressing them enough, your spirituality and sense of calm, your social antics, your brain power - do you challenge yourself enough? Your authoritative skills at work or with friends - do you have trouble saying "No" to people? Or are you actually in need of some physical wellness improvements in the form of diet and exercise? Are you over-working yourself on the job? Or maybe you just want to give yourself more happy moments, are you laughing out loud enough? You may need some LOL training. The possibilities for improvement are vast! Everyone can use a bit of wellness "strength-training." No hand-weights required! The trick is to really step back and look at where in your life you are constantly frustrated or feel some blocked energy (sounds weird, but you probably know what I mean!) Then slowly do "work-outs" for that area of your life. Some examples..
* "No" training. If you have trouble saying "no." .. Say no to something you would normally say yes to. Make it super simple, when dining out and the waiter asks you if you want a water refill, instead of nodding politely, say "no thank you." Silly? Yes! But then build up to saying no to bigger things like side work events, favors, business favor request and more. You can only put so much on your plate. Learn to say, "No, my plate is full!" And do not follow that "no" with "sorry." You do not need to apologize for watching out for your own wellness. * Zen training. If you are feeling over-stimulated via your cell phone, social networks, music, TV, sounds and busy life. Take ten minutes. Just TEN minutes to sit in a quiet corner and do nothing. Meditate. If you do not know how check out the HeadSpace App, it rocks. Work up to longer periods of time as you "strengthen" you quiet time muscle! * Happy training. If you need more laughter and smiley faces in your life, start working those giggle muscles! Click over to Buzzfeed's LOL section (cute cat photos anyone? ), or "force" yourself to watch a comedy or a TV show that you know will make you laugh. Give yourself a laughter break during the day (if you can) or in the evening. Build that funny bone and a sense of happy may come more naturally to you over time! And on and on... figure out how you can train yourself. Me... As a blogger for (six!) years now, I am always looking to strengthen my social muscle. I was a highly social person all through high school and college so the abrupt switch to "stay at home blogger" left me feeling very weak and lost. It was like someone handed a pair of ice skates to a swimmer and said, "Here, go do some backwards skating now!" Well anything is possible if you strengthen those "muscles." Weaknesses are our Secret Strengths! It is so important to know our strengths and weakness. BUT even more important is to realize that our natural "weaknesses" may actually be our hidden strengths! Confused yet? Well my natural love of being in my own head, thinking creative thoughts, loving my alone time and craving the internal feeling of being inspired may not be so helpful if I want to win the party-goer-of-the-year award but it certainly does help me in my career! So I'll take it. Another example, if you are a person who says "yes" too much, well that probably means you are a kind, caring, thoughtful person who wants to make others happy. Not such bad qualities in a person! Strength. And maybe sometimes a weakness. So you have to look at the big picture. Are your secret strengths/weaknesses making YOU happy? You can keep your secret strengths and strengthen them even more too. It just takes a little practice to build some muscle. Build everyday to make yourself a stronger person from the inside out! Long food for thought today, but I hope it gives you a bit to analyze about yourself. With all that to mill over and figure out, lets eat sandwiches together!! 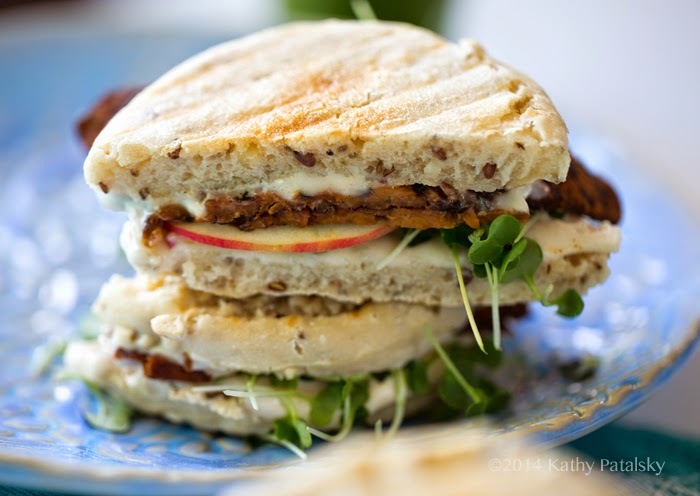 The panini-pressed, grilled, yummy, sunny, vegan cheesy, on gluten-free English muffins, with tempeh bacon kind. You in? Lets go.. 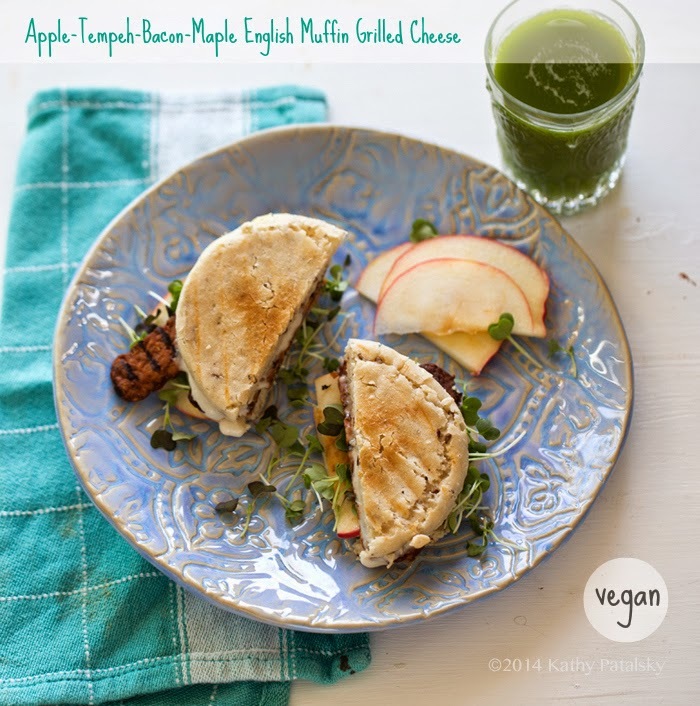 This tempeh bacon and vegan cheese infused English muffin is accented with sweet apple slices. 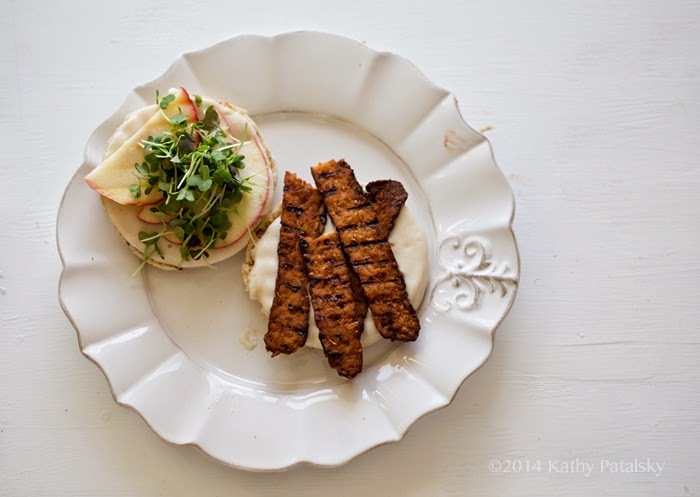 Tempeh Bacon directions here or you could even use pre-flavored tempeh bacon strips. 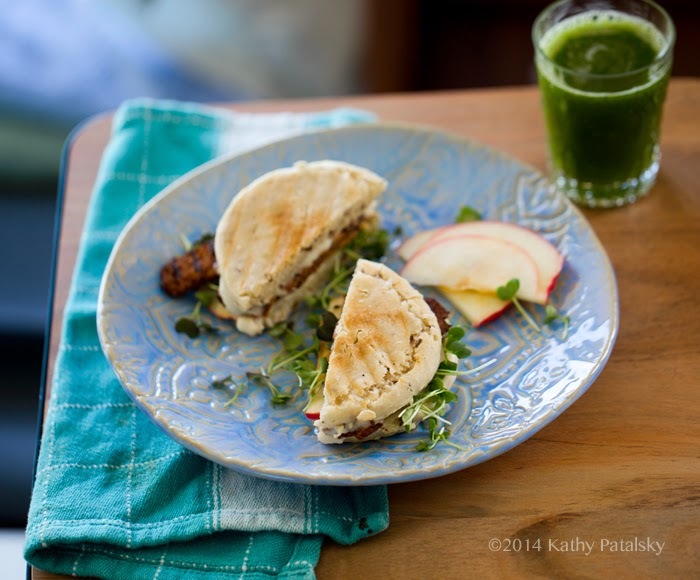 Warm up you panini press or skillet. 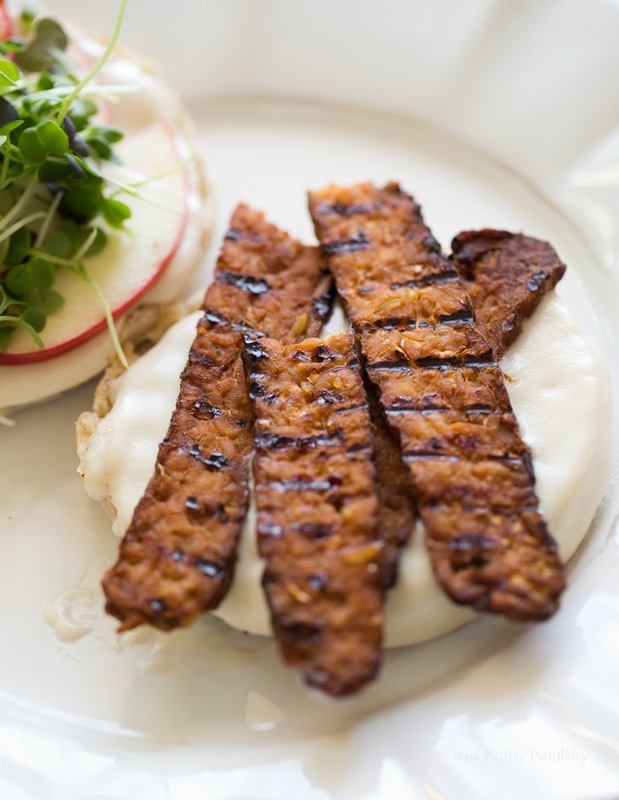 Cook the tempeh bacon first, until sizzling and browned around the edges. 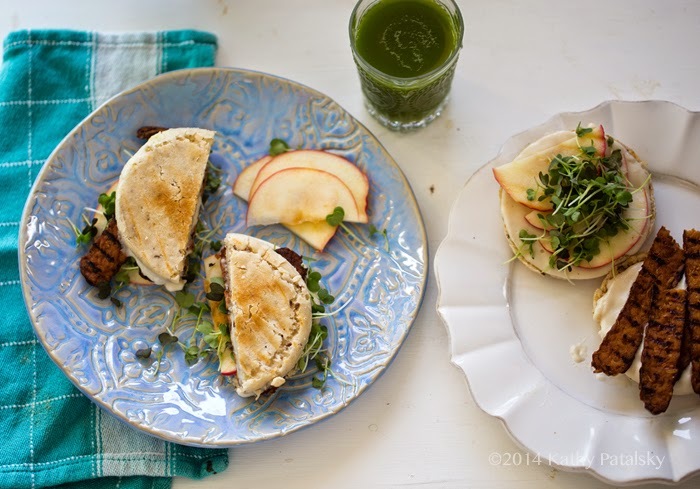 While the tempeh is cooking you can add the English muffin halves to the grill or pan to warm them. 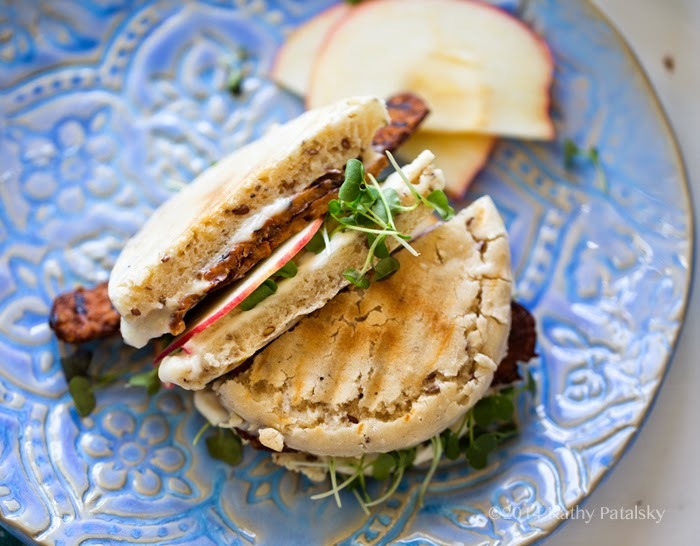 Place the toppings on the warmed English muffin halves, cheese, tempeh, apple and one teaspoon of maple syrup for each sandwich. Add a pinch of black pepper too. (You will add the sprouts or micro greens just before serving.) 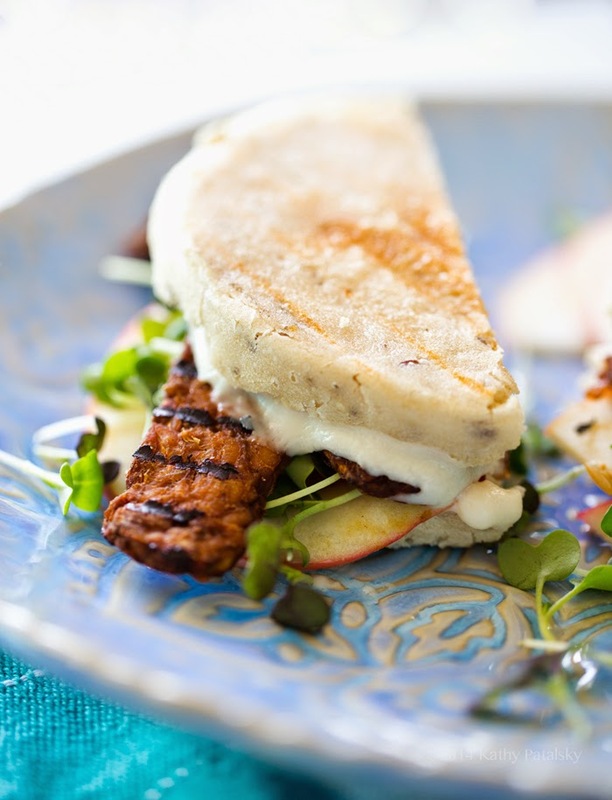 Grill or cook until the cheese melts over the sides and the muffins lightly brown. Slice sandwiches, lift the tops and stuff the sprouts or greens inside. Serve!